My husband and I met when we were teenagers and we have officially been together for 17 years! We have celebrated a LOT of birthdays together. Every year as Grant's birthday approaches, I try to come up with a unique birthday gift idea for him, but I always end up relying on the same gifts. I always choose his favorites but after a while the gift of clothing, cologne, DVDs or electronics starts to get boring. I was determined to come up with something unique this year! Grant deserved something extra special. 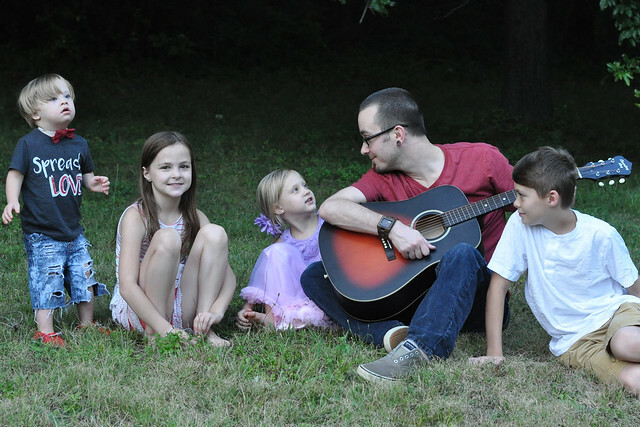 He puts in so much time at the office and works tirelessly for his family. 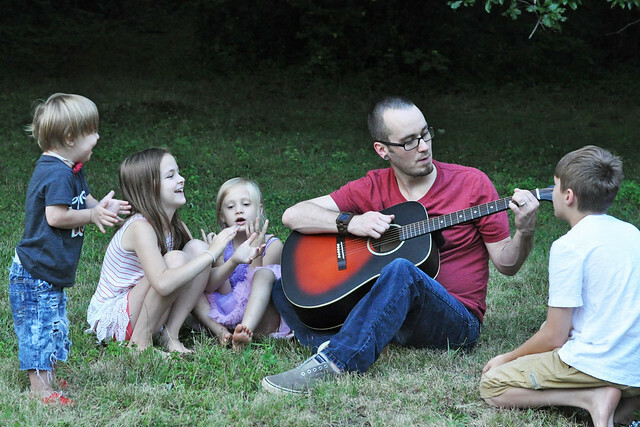 He always arrives home to a house full of kids, noise and chaos, but no matter how tired or stressed out he's feeling, he always makes time for us. I wanted to give him something he wasn't expecting for his birthday this year! Grant always loved watches. I gave him an engraved pocket watch shortly after we met, but he eventually stopped using it out of fear that it would get lost. 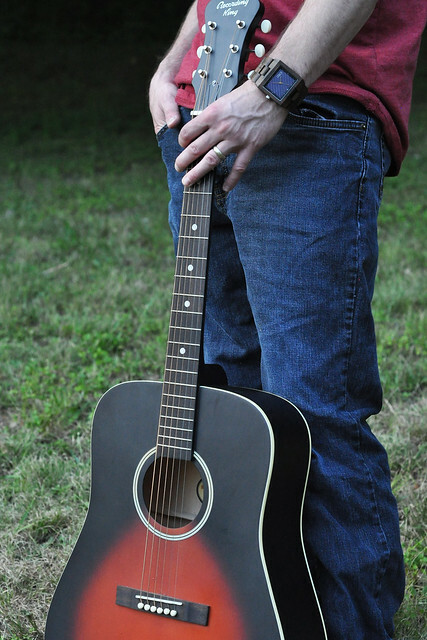 Instead, he relied on an old favorite which broke a while back and never got replaced. When I received a JORD watch to review a few months ago, my watch-obsessed husband was incredibly jealous. So when JORD asked if I was interested in collaborating again on their Summer campaign, I jumped at the chance! The timing was impeccable! 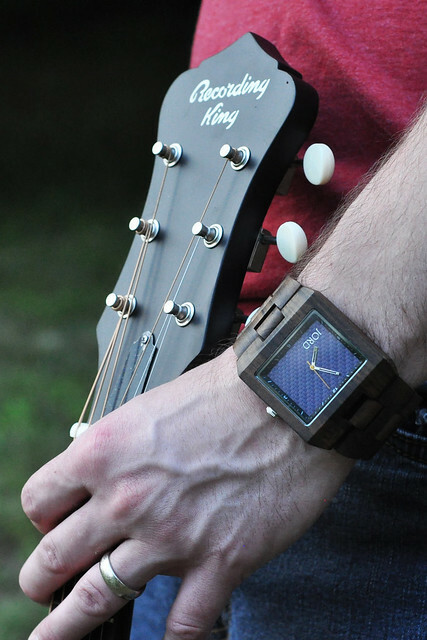 What better gift for the main man in your life than a beautiful wood watch? 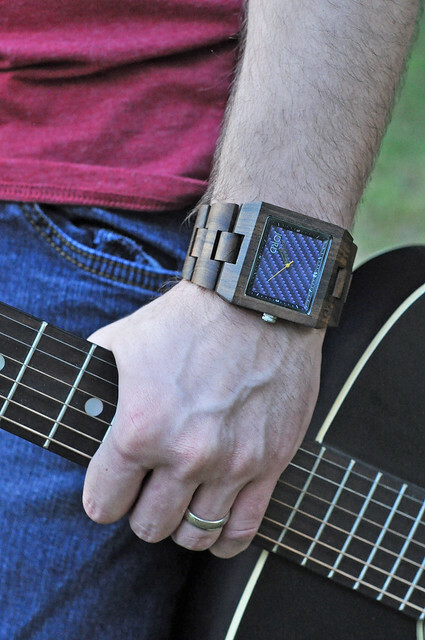 I was overwhelmed by all the beautiful wood watches that JORD offers for men. There were so many available that I knew my husband would love! There was one in particular that caught my eye immediately, though, and I kept going back to it. 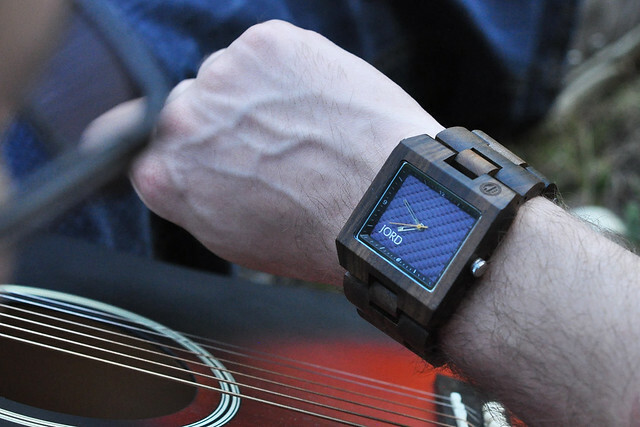 I just knew the Delmar Dark Sandalwood & Blue Carbon wood watch would suit my husband perfectly! When that gorgeous engraved wooden box arrived, I was giddy with excitement! I opened the lid and slipped the watch off the tiny engraved pillow. It was even more unique in person than it was online. The coloring and the grain of the wood was simply stunning. I couldn't wait to give it to him! 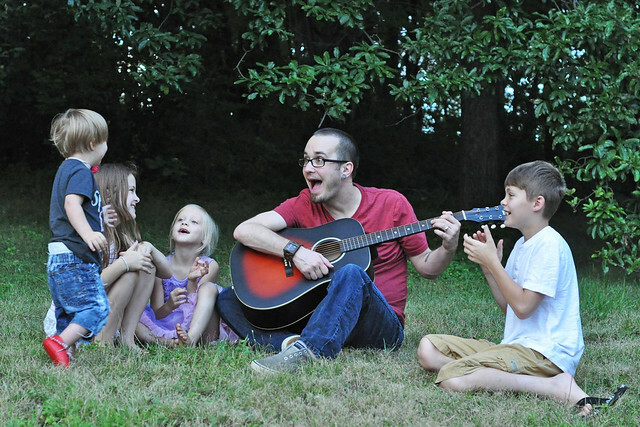 Grant celebrated his birthday at the end of July and sure enough, he absolutely loved it! He's thrilled to have a JORD watch of his own. 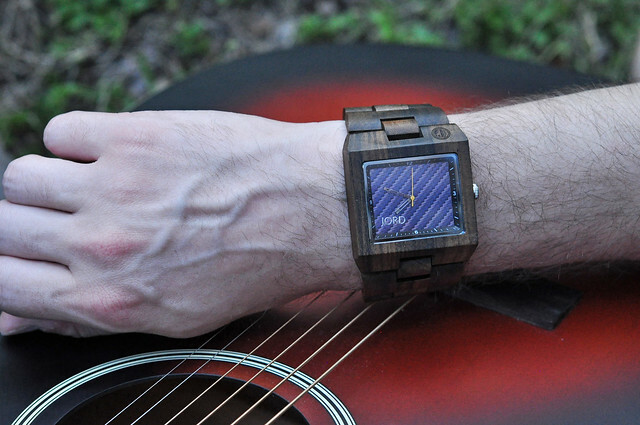 This JORD wood watch is every bit as unique as he is. I don't think he has ever owned a watch that fit him more perfectly than this one. It can easily go from business casual to his preferred relaxed style, which suits his lifestyle quite well! 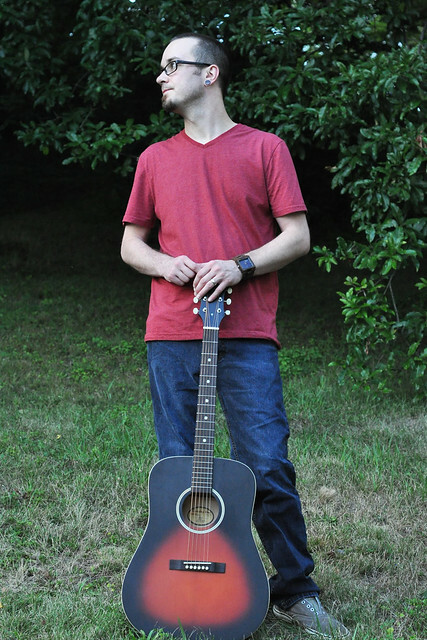 One of Grant's favorite features of his JORD watch is the clasp which makes it easy to switch wrists in a flash when he's playing his guitar. 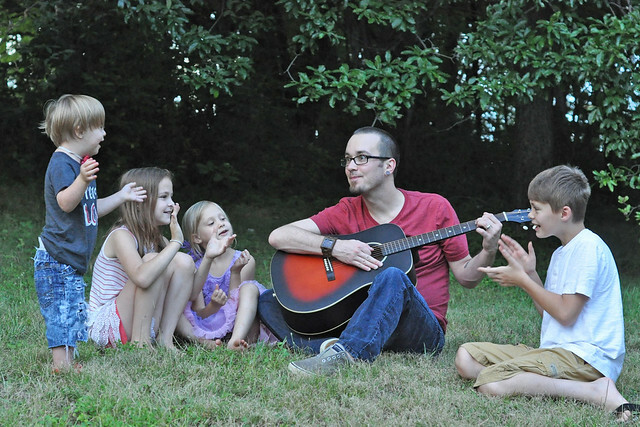 That means he gets even more time to focus on his hobby and play for his kids! One of MY favorite features is the fact that JORD watches can be custom sized before they even ship. JORD has a handy wrist measurement tool to download and print for accurate measurement. A few other things worth noting is the scratch-resistant glass and the pretreated wood that is splash-proof. These beautifully designed watches are quality and durable! Perhaps the best thing about JORD wood watches is that they are timeless and truly unique. Every last detail is well thought out and designed. From the intricate packaging to the unique features of each watch they offer, these watches are stunning. JORD watches are designed to spark attention! I couldn't have come up with a more unique gift than a JORD wood watch for Grant's birthday. It's something that he will wear every day and treasure forever! 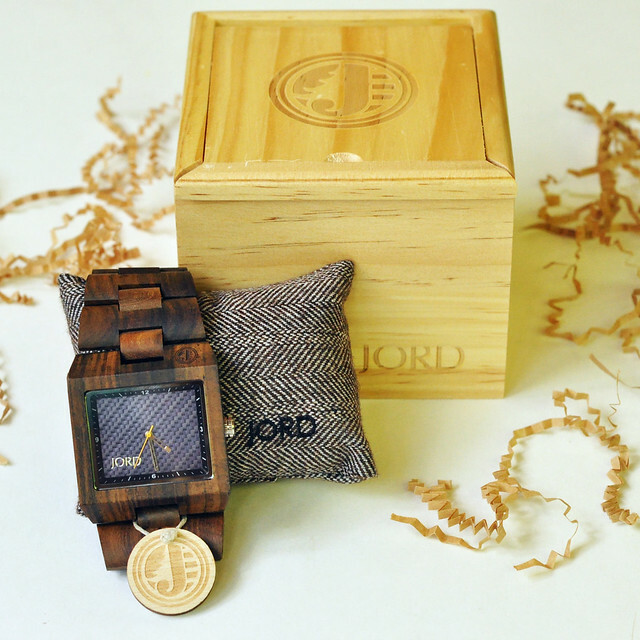 ONE winner will receive a $75 e-gift code to purchase their own JORD wood watch! In addition, every other entry will get a $20 credit to spend on the site at checkout! Entering is easy. Just click the link below. Good luck! Thank you, JORD, for helping me give my husband a truly unique birthday present this year! DISCLOSURE: This post was sponsored by JORD. I received a product in return for my honest review. No other form of compensation was received. That watch is awesome what a perfect gift for your guy! I hope he has a great birthday! It does look like it was made for him! Their watches are so cool and I love the one you chose. It looks perfect for your husband! I love that watch. Great choice. He looks great with it. I love Jord! I just got my husband one for our 5th wedding anniversary. Perfect since the theme is wood! I love that watch! I've been seeing Jord around, I'm going to have to check them out. I got my husband one too and he loves it!! This style is awesome!! I LOVE that choice!! Happy birthday to your sweetie! I really love your choice, ialso love this watch actually It is my favorite brand and I have lots of collection of watch of this. Find the best online store to buy the trendy & unique watches at best price.